Ken Clark inspects water holding and disinfectant tanks inside the shed of the Ozone Pines water system, just outside the Slidell city limits. 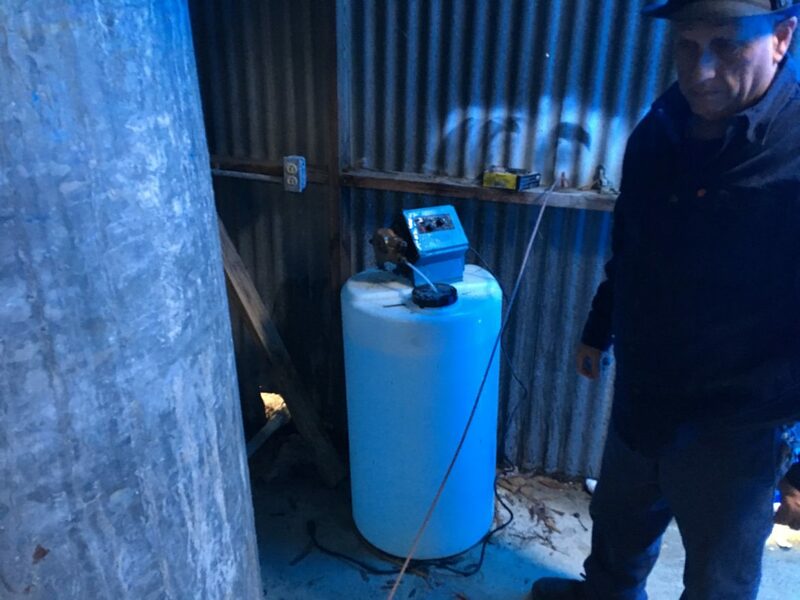 Volunteer Ken Clark inspects water and disinfectant holding tanks inside the shed of the Ozone Pines water system, just outside the Slidell city limits. When Clark built his own home at Ozone Pines in 2005, he said, a previous well manager had died recently and that manager’s elderly daughter tried to manage the system herself, but couldn’t. Clark says he considered digging his own well, instead of using the old artesian well sitting on an abandoned property in the neighborhood. “And I said, well, if I do that, I’m going to cut everybody off in the neighborhood, and I’m not going to do that,” Clark told The Lens. So he connected the pipes to his new home to the well system and tried to manage it himself. Clark said he has been fixing pumps and maintaining the system with money out of his own pocket. He estimated that he’s spending more than $4,000 of his own money annually to maintain the system. A burst pipe a few years ago cost him more than $8,000, he said. Clark said the 30 or so nominal customers of the Ozone Pines system are not paying him for the service, but he hasn’t cut them off — the system has no meters and no shut-offs, he said. Source: La. Department of Health. Clark said it’s been three or four months since he’s heard from authorities. But state health officials have been monitoring the Ozone Pines system. They’ve written up the system for a long series of violations, including failure to maintain adequate levels of chlorination to disinfect water coming from the well and failure to take routine samples in compliance with the federal Lead and Copper Rule, which limits the amounts of those toxic substances in drinking water. Records from the St. Tammany Parish Clerk of Court indicate that in 2017 a judge appointed a temporary receiver, Gilbride’s Aqua Service, to take over managing the water service. But according to the state Department of Health, that company’s owner declined. Clark said that once he explained his situation to the Health Department’s attorney, he was allowed to continue running the system while authorities sought either to find an official operator for Ozone Pines or consolidate it with another nearby systems. Nearby Resolve Whisperwood Estates and Magnolia Forest water systems are mentioned as candidates. The Ozone Pines water system is one of 10 on a state list of rural water systems that are in immediate need of assistance. But Clark said state officials have done little to help him so far. “The only thing they’ve been trying to do is find somebody to take it off my hands,” he said. “And that ain’t been successful at all. And I said, ‘Well, why don’t you come in and help me fix the well and do what we need to do to make the well to where it’s… all up to date, you know? Then, they’re not for that and I don’t hear from them no more. Leslie Durham, who chairs the governor’s Rural Water Infrastructure Committee, said the state’s priority list is compiled by evaluating several factors, including the size of the systems in question and their customer bases, the quality of the water they provide, how the systems are presently managed and the state of their finances. Durham said the 10 systems on the current list checked off all the boxes. “We kind of considered them as being, like — and these are my words — a hiccup away from catastrophe,” she said. One of those failures occurred in late 2016, after a pump broke down in the Robeline-Marthaville water system, near Natchitoches in northwest Louisiana. “They were having trouble getting water up and down the hill,” Durham recalls. That emergency affected 481 customers, who lost their water service shortly before Christmas. Durham said many small, rural systems face similar risks. The state will deliver water to communities only in emergency situations, Durham says. In the case of the Robeline-Marthaville system, the Red Cross delivered some water while a temporary pump was installed. 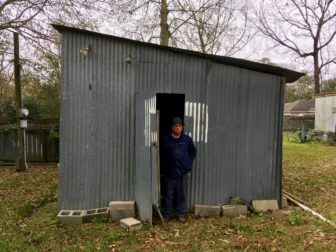 Eighty-eight percent of Louisiana’s 4.68 million people depend on public systems for their drinking water, according to the U.S. Geological Survey. That includes systems as small as Ozone Pines to New Orleans’ Sewerage & Water Board. The remaining 12 percent of residents primarily uses private wells. The conditions of those aging public systems are a point of serious concern. The problem was highlighted just two years ago, when the American Society of Civil Engineers published its 2017 Infrastructure Report Card. Louisiana drew a grade of “D-” for drinking water services. 58 percent of Louisiana’s public systems were built before 1960. “Many of these systems are neglected until an immediate need arises, such as a significant leak in the pipe network,” the ASCE wrote. Maintenance costs are rising because so many systems are in operation well past their “intended design life”, requiring more frequent maintenance and replacement of system components. Even when components are scheduled for replacement, “it is likely that some of the materials used to construct older systems are no longer used in the industry,” requiring a significant reworking of entire systems. Fewer than 70 percent of public water systems using aquifer sources — essentially underground layers of rock or similar substance bearing water — have wellhead protection plans in place, as required by federal law to protect such groundwater sources from contamination. State Health Officer Jimmy Guidry said the subject of failing water systems, especially in rural communities, remains a topic for serious discussion in Baton Rouge as more and more residents turn to the state for help. 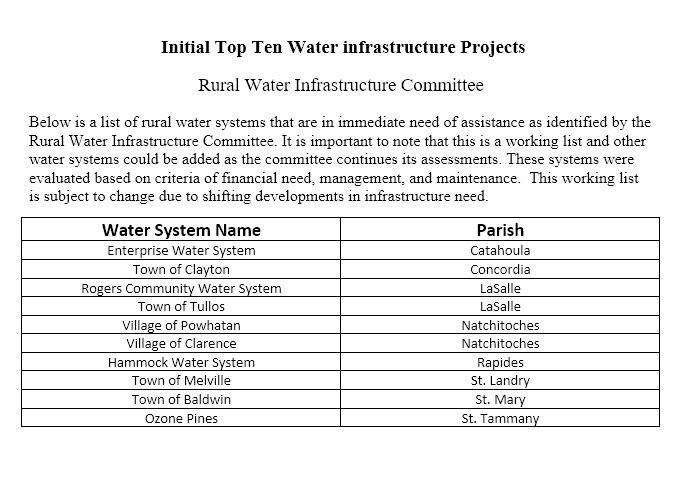 Guidry says many of these water systems serve rural communities that are struggling to survive. The small town of St. Joseph is a critical case in point here. The governor declared a public health emergency there after samples from two of 13 test sites in the town came back with elevated levels of lead in 2016. State emergency authorities delivered bottled water to the town for months, with each individual receiving three liters a day, and ordered an administrator to go in and take over the town’s water system finances. Rebuilding the town’s water system took 14 months to complete and cost more than $9 million, covered at the time by grants and state tax funding. St. Joseph customers have clean drinking water again. But their water bills have gone up about 45 percent from what they were before the emergency declaration, according to a report in The Advocate. A second option for struggling water providers is consolidation: smaller systems combining with neighboring water systems, as LDH hopes to do with Ozone Pines. Such a move creates a larger customer base and, theoretically, makes necessary repairs and upgrades more affordable. But Guidry said that is by no means ideal. Durham with the RWIC said delivering water to these communities is impractical and cannot be viewed as a permanent solution. Meanwhile, Ken Clark said he continues to struggle with the old well system for the Ozone Pines neighborhood. The well itself sits on Lowerline Street off Brownswitch Road, next to an old shed with a leaky roof where the system’s pumps and filters are kept. 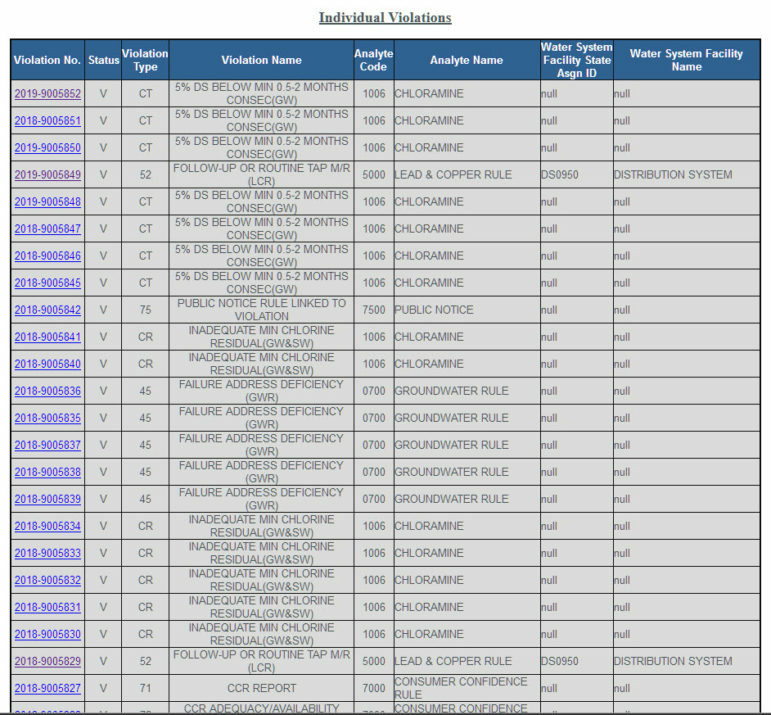 Inadequate levels of chlorine are among the numerous violations for which Ozone Pines has been cited for the state. But Clark said he’s limited on how much chlorine he can put into the system. Clark said his yearly costs include replacing old pipelines, paying for excavation crews and sealing off a leaking wellhead. While the state did not verify that he’s spending the $4,000 to $5,000, he claims to be spending on average in a year, health officials acknowledged that he is paying the electric bills to keep the system’s water pumps running.